Surf News Network, 25 April, 2015. 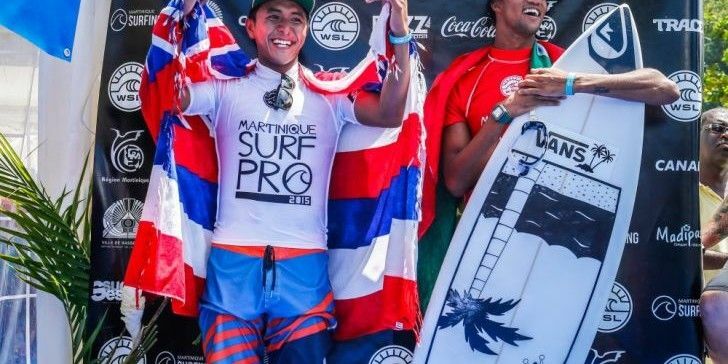 Brasse Pointe – Joshua Moniz (HAW) 18, has won the inaugural QS3000 Martinique Surf Pro over Michael February (ZAF) 21 in an exciting final at the righthand pointbreak of Basse-Pointe. Moniz couldn’t start his final any better, catching an excellent wave in the opening seconds, to deliver a series of exciting fronthand turns and collect a 9.07. The Hawaiian didn’t take his foot off the gas and continued to capitalize on every opportunity he got to finally net an 8.87 as a backup and win the event. Moniz, despite posting big scores all week was in the underdog position up until his quarterfinal matchup where he dispatched of South-Africa’s Beyrick De Vries (ZAF) 22. He then emerged as a potential threat for the event crown, and convincingly surfed two more briliant heats to take the title home. February, who posted one of the only two perfect 10 point rides on Day 4 in the quarters, didn’t not let Moniz’s first score alter his motivation and kept battling all the way to the final countdown in search of the 9.37 he needed to take the win. The South-African opted to go local in terms of accommodation and stayed with a Martinican family to immerse himself into the local vibe. Supported during all his heats by an excited crowd, February has won the hearts of many Basse-Pointe locals today. In the first semifinal, a tight back and forth battle for first position was a goofy vs. regular opposition that eventually went February’s way. Despite leading the 30-minute exchange from start to finish, Miguel Tudela (PER) 20, couldn’t contain the South-African hailmary attempt in the dying seconds that got him the winning ride. Tudela placed equal 3rd in Martinique. Cooper Chapman (AUS) 20, fell short of a mere 0.34 in Semifinal N°2, after an exciting final exchange with Moniz in the last instants of the heat. Chapman improved both his counting rides including an impressive 9.03 on his very final wave, but he couldn’t match Moniz’s flair and rhythm.